Posted on June 29, 2018 by Ryan D.
Thanks to high demand for our Teen Adventure Trips, we’ve added a second session of our Footloose in the White Mountains trek to this summer’s lineup. Wildwood Teen Adventure Trip Leader Amanda is pumped up and looking for a few more adventurous teens to take on the challenge with them this July. Here’s what’s got her so excited and why you should be too! The White Mountains of New Hampshire: A sweet escape for the weekend warriors of Boston; a training ground for the aspiring rock climbers, backpackers, and mountaineers of New England; and home to the sweeping granite ledges of North Conway, the towering cliffs of Franconia Notch State Park, and the steep schist crags of Rumney. For young adventurers looking to engage with gravity, the Whites are a playground of snowy slopes, swift water, rock faces and rugged trails. Wildwood’s Footloose in the White Mountains Teen Adventure Trip challenges teens to discover their potential for the skills and movement of outdoor rock climbing and backpacking in some of the most beautiful areas in the Northeast. I have spent the past 11 summers at Wildwood in a variety of programs, as a Camper, a Leader-in-Training, a Junior Counselor, a full-fledged Counselor, and a Unit Leader, but some of my most unique camp experiences came out of the three summers I spent as a Trekker. Footloose in the White Mountains was my very first trek. Not only did the Footloose trek increase my confidence and self-reliance in the outdoors through hands-on skill-building experiences, it also introduced me to the sport of outdoor rock climbing, something I am still passionate about. I am so excited to be on the other side of things on this trek, creating similarly awesome experiences and memories for this year’s Footloose trekkers! Will they be wearing helmets? YES, they will always be wearing helmets (and harnesses) while rock climbing. We love brain-buckets and safety is a top priority for us. Trekkers always stay a body-length or more away from cliff edges. What if they lose their grip while climbing? The style of climbing our trekkers engage in is called “top-roping”: The rope runs from the tied-in climber up to an anchor at the top of the climb, then back down to the belayer. As the trekker climbs, the belayer takes in slack. This means that your child will never fall more than a foot or two, whether they are eight feet off the ground or eighty. 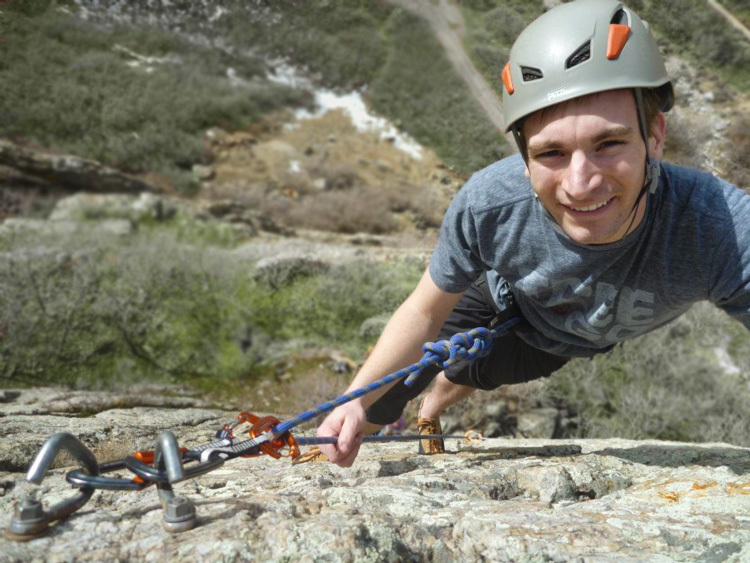 Before we get started, we’ll spend a few days with professional rock-climbing guides to literally learn the ropes. What if it’s too hard for my Trekker? The rocks in Rumney offer options for just about everybody, with hundreds of routes of varying steepness and features. Trekkers will be able to try a range of techniques, including practicing rope skills on the ground, experimenting with movement on rock, and pushing their limits on steeper terrain. All of the climbing is challenge-by-choice, so if they don’t want to do something, they don’t have to. But we bet they will. What’s the Biggest Payoff of the Footloose Trek? This trek is an incredible skill and confidence-building experience for kids with all kinds of backgrounds. They WILL find something that they’ll have fun on, we guarantee it. Rocks are too cool not to be fun! 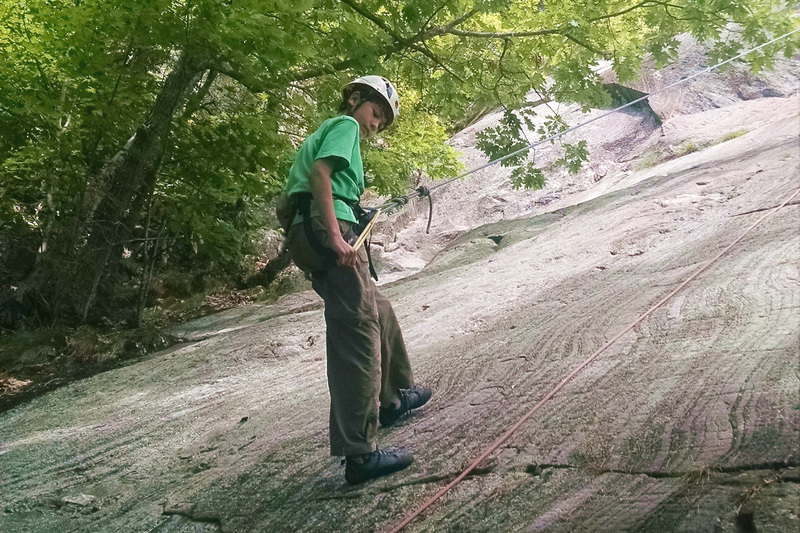 Send your teen our way and we’ll show ’em just how fun climbing and backpacking can be! To learn more and sign your teen up for the adventure of a lifetime, visit our website. This entry was posted in Summer Camp on June 29, 2018 by Ryan D..